Free Shipping Included! 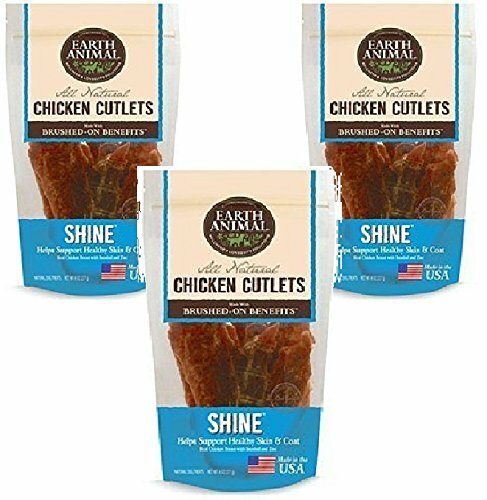 Earth Animal - Shine - Chicken Cutlet Treats 8oz Each (3 Pack) by Earth Animal at Gerdas Animal Aid. Hurry! Limited time offer. Offer valid only while supplies last. Earth Animal's Brushed-On Benefits Shine Treats are brushed in a tasty oilive oil marinade with Inositol, a B vitamin associated with healthy skin. Earth Animal's Brushed-On Benefits Shine Treats are brushed in a tasty oilive oil marinade with Inositol, a B vitamin associated with healthy skin. Inositol also helps in the regrowth of hair. Zinc is an essential mineral required for the health and development of the skin and coat.